In order to provide a comfortable space for clients and patients, you need the right equipment. At MassageTools, we offer a wide variety of tools, tables and other items that you need to make your office more welcoming. 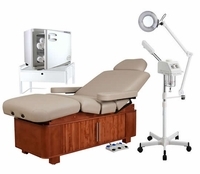 From cozy, cushioned spa tables to accurate ultrasound equipment, we have everything you need to ergonomic CPM equipment, each product helps create a relaxing and comfortable experience for the client. As any massage therapist, spa service provider or health care professional knows, customer and patient comfort is key for repeat visits and for successful results. Though the products we offer are focused on patient comfort, that's not all they can do. We've carefully selected the only massage and health care equipment that helps us provide the best care for each individual. A variety of features are included with each piece of equipment to ensure that you can help your patients feel better each time they visit you. 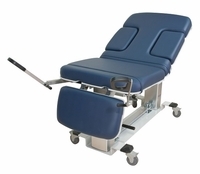 Whether it's a massage table with an adjustable backrest or ultrasound applicators with waterproof, sealed heads, these are the products that have been proven again and again to provide optimal care for those seeking health care, massage or spa services. At MassageTools, we're picky about which products we offer. That's why you'll see a number of trusted name brands among our products. From Spa Luxe and Comfort Soul to Chattanooga and Oakworks, these brands offer high-quality products that will last for years, even in busy clinics and practices. You can rest assured that your client's comfort and care will be improved by using the equipment available from these manufacturers. To get the day spa equipment, physical therapy equipment and medical tables you need, shop this selection of reliable products from MassageTools. This equipment selection is perfect for those working in the massage, spa or health care industries who wish to provide the best experience for the clients in their care.